Be a pilgrim for a day on one of our guided Via Francigena walks and hikes in Tuscany. 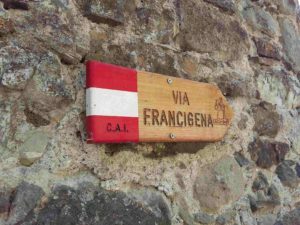 The Via Francigena was the main route connecting the whole of Europe in the Middle Ages, walked by pilgrims, merchants and armies. The historic itinerary we know today was described by Sigeric, the archbishop of Canterbury, in his travel journal during his trip to Rome, and is now walked by more and more pilgrims and travellers, representing one of the main historic routes in our Country and in Europe. 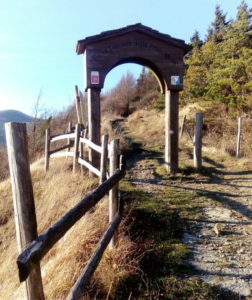 The Via Francigena enters in Tuscany through the Cisa Pass, stretching along the whole of the Lunigiana valley, crossing the two main stages of Pontremoli and Aulla before getting to the coast. You can experience to be a pilgrim for a day on one of our guided Via Francigena walks and hikes in Tuscany, for one or more days. You will walk along ancient paths and mule tracks, immersed in silent chestnut woods, crossing beautiful stone bridges, medieval villages and castles, Romanesque churches, with views over the Lunigiana valley. Rivers, woods and villages that will tell you the tales of medieval pilgrims and traders who walk this historic path for centuries. A trip across history, spirituality, ancient traditions, genuine food and authentic landscapes of this undiscovered area of Tuscany. This tour can be booked on request for individuals or small groups. Contact us for more info or to create your own itinerary. The Via Francigena is an experience suitable and advisable also for families with kids, to introduce them to the pleasure of walking. Check our Francigena 4 Kids tour.